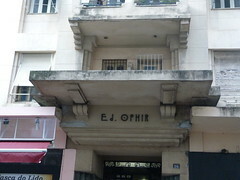 During our Art Deco walking tour of Copacabana I lingered for a short time outside this apartment block, Edificio Ophir. As most of the group moved on, the doorman stuck head around the door and I made the most of my Portuguese lessons and ventured something along the lines of posso ver o interior? - Can I see inside? It worked because he opened the door wider and stepping aside beckoned me to come in. The walls of the foyer have relief panels with stepped tops and an inlaid tile set at an angle creating a diamond shape. 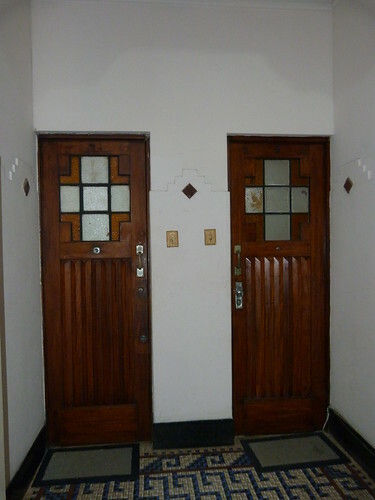 The doors to the apartments are plain would with coloured glass windows forming a cross. 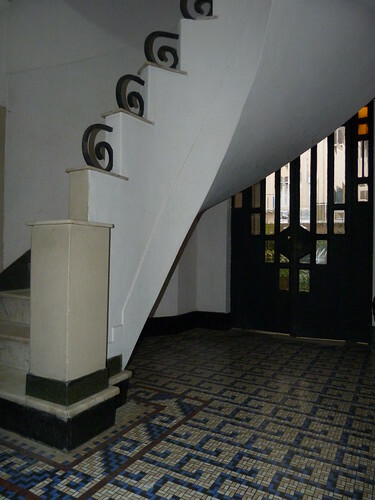 The floor has a blue geometric pattern on a cream background and off to the left a curving staircase led off to the upper floors. The door past the stairs leading to the back of the property is a simpler version of the main door which I think looks fabulous backlit from the street outside. By the time I'd finished taking my photos and thanking the doorman, the group had disappeared. 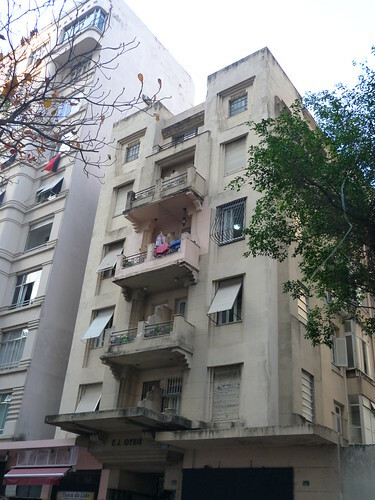 I was staying in Copacabana and kind of knew the area so I wasn't lost as such and there was another Aussie with me who had shared in the good fortune. Together we checked around a few corners and it wasn't long until we spied the tail-end of the group and were able to catch up in order to see the next building on the tour. What an interior! The staircase is exceptional. It was a real bonus to see inside and I agree wholeheartedly about the staircase. 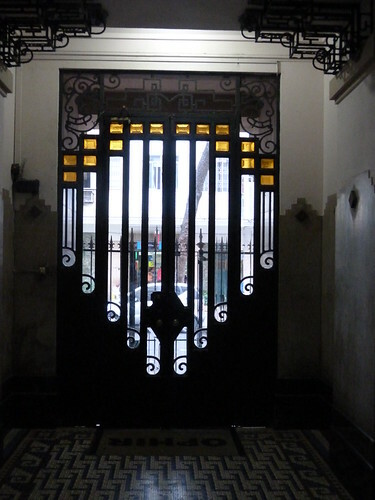 Yes, that main door is absolutely amazing during daytime backlit from the street outside. :) The design is truly beautiful.